Lots of great stuff happening during April! Close to My Heart is offering a beautiful stamp set Hope For Japan. It's an A-Sized set valued at $7.95 for only $5.00. All profits will go to help the American Red Cross efforts in Japan to help the victims of the Tsunami/Earthquake. You get a beautiful stamp set at a discounted price and you help the Red Cross help those in Japan who are in sudden need. 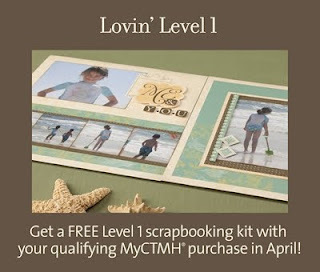 Also this month, if you order from my website at bzscrapper.myctmh.com and you spend $100 you not only get the Stamp of the Month, Blessed, free, but you will also earn a Level I paper pack free! There are a few to choose from. It's a great time to order online! If you are a Studio J member, take advantage of free Sparkles and Opaques gems when you place an order of 10 layouts this month in addition to all the regular benefits of being a member such as half price layouts, free shipping once a month, free page protectors and free jpeg files of your layouts! I know my creativity has been renewed this Spring... I've been doing a lot of pages lately and will be uploading a few soon. Let your paper and stamps call you on those rainy days.... the dusting and vacuuming can wait... it will be there!